5.71 points at 14 votes (rank 694). 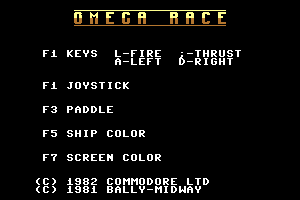 Omega Race is a conversion of the arcade machine with the same name. The deficit of a black and white design on the original machine was compensated by a coloured overlay over the screen. It is a vector graphics game where you can - as in Asteroids - turn your spaceship or give it a thrust by activating the rocket propulsion. Instead of asteroids you need to shoot UFOs and their mines here which gives you the corresponding points. The hostile spaceships can shoot back, hostile shots and obstacles as well as collisions with the enemies destroy your ship. The game is over when all three own ships are destroyed. 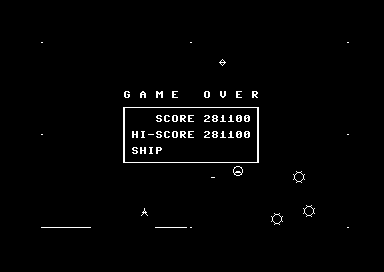 In contrast to Asteroids, there are protective shields at the border of the screen, where the ship will bounce off. So you cannot fly further than the border of the screen. 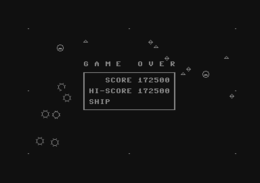 In the middle of the screen there is a rectangular protective zone, where the highscore and the ships that are left are displayed. The game originally only existed as cartridge version and it can be played with different input devices in joystick port 1. Simple unicoloured (optionally white) HiRes graphics on black background, whereby the colour of the ship and the background can be changed with the keys F5 or F7 . Simple background music and some sounds are played. 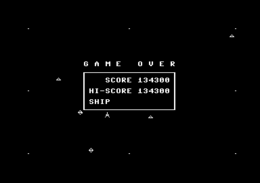 The display for points and highscore is in the middle of the screen and makes the ships bounce off. Do not accelerate the spaceship too much, that way it is better to steer. At the beginning of every round it is good to wait until you see in what direction the "Druids" move and then place your own spacehip behind them. Your own rockets have a greater reach than the ones of your enemies, therefore you can get safe in a corner of the screen and "clean up" from there. If there is only one opposing spaceship left, it is advisable to destroy the "Photon Mines" and "Vapor Mines", they get you points. H.T.W: "Vector graphics are not really one of the strengths of the C64, but in this game the feeling of the machine was taken over very well. However, when operating with the paddle, a second fire button is missing and the graphics seems a bit "nacked" without the overlay. Anyway a very interesting game due to the flight characteristics and the 'bouncing effects'." TheRyk: "An ancient gem! Of course it would not have been released like that anymore a few years later, vector graphics did not really succeed on the C64 apart from a few exceptions. 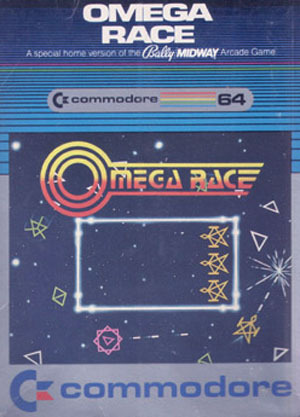 But for a 1982 game, Omega Race is really playable and quite fun time and again, 6 points." Omega Race in the Killer List Of Videogames.